Wood or Biomass Pellet Line is always made up such equipment like wood chipper, crusher or hammer mills, and moisture reducing equipment like airlfow dryer or rotary drum dryer, pellet mill, pellet cooler and separator, pellets packing machine. How to choose the types of each equipment? We will help you to sort out the best machine for your production, but first of all, we need to understand the basic information before provide you an outline price and specification of the pellet line. 6. The standards of your electricity. ie 380V/440V//415V/220V, 50HZ/60HZ. Because the electric elements made in China are 380V/50HZ, we must supply a different elements to match with your electricity standards. We will supply tailor-made proposal based on your basic informaitons. We can install your entire plant from the ground up or we can help you pick and choose what parts we will do and what parts you can do yourself to help keep costs down. Our years of experience can help us size and design your system to work right. Also, we have some sample pellet line for your consideration. Mobile pellet plant for straw, with output 200-300kgs per hour. Production line for oil palm EFB pellets, with output 2000-2300kgs per hour. These are simplied and semi-automatic pellet line, high effient and less investment. The wood/biomass pelelt line will be ready for delivery in 45 days upon buyer's down payment. Considering the long distance and long time of ocean shipping, we will ask the container to load the equipment in our factory to avoild rude handling in the port. Package material will be strong plywood case and iron cases. Commissioning of the plant and tranining will be on your cost. 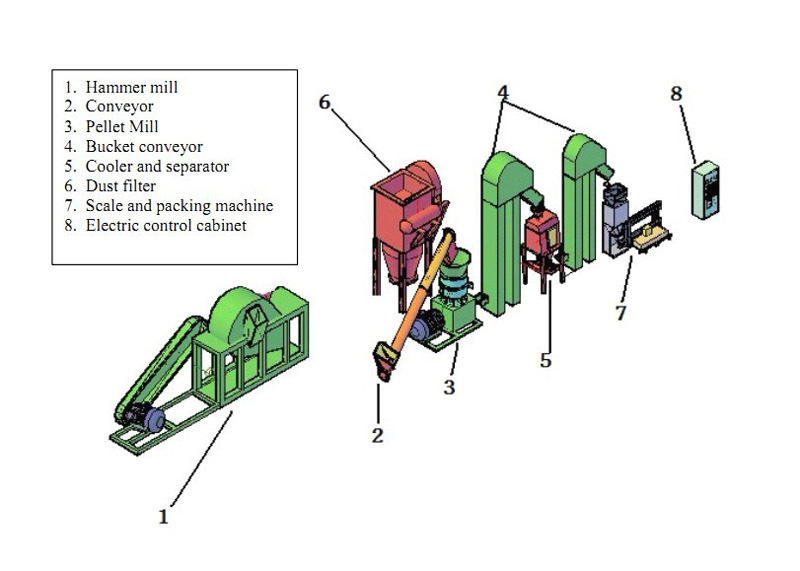 Biomass pelletizing machinery for Recycling wastes to Produce Energy. Equipment to make pellets from sawdust and efb fibers, straw fibers and etc. A moisture meter is helpfuel for you to understand the moisture content of your raw material. Please click the pictures below to see the details of each pellet line.